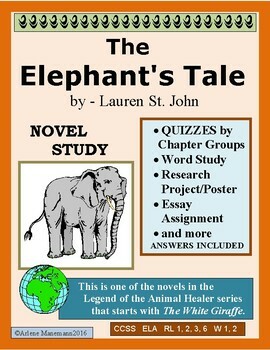 This product is for Lauren St. John's The Elephant's Tale - one of the novels in her series of the Legend of the Animal Healer. 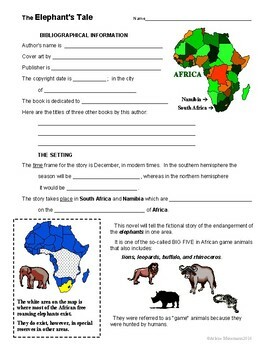 Set in southern Africa, it deals with the endangerment of African elephants. - Word Study for Part 1 - Ch. 1 to 5; Part 2 - Ch. 6 to 10; Part 3 - Ch. 11 to 16; Part 4 - Ch. 17 to 21; Part 5 - Ch. 22 to 26; & Part 6 - Ch. 27 to 32. 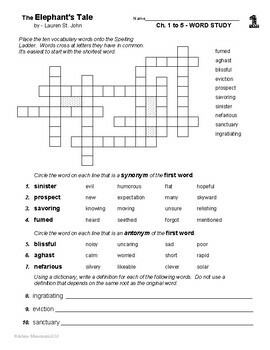 - A one page reading comprehension quiz for each of the above parts, which include True/False, Cause/Effect, Match the persons being described, multiple choice, and sequence. Please see the Preview for some sample pages.